The castle was founded soon after the Norman conquest of 1066 by William de Warenne and was initially a stone 'country house'. During the first half of the 12th-century, however, more disturbed conditions prompted its progressive conversion into a strong keep, further defended by stone walls and an immense system of ditched earthworks. Still impressively visible, these are perhaps the finest village earthworks in England. Free entry, open all year. The recreated herb garden situated next to the visitor centre grows herbs that the monks would have used for medicinal, strewing, culinary and decorative purposes. 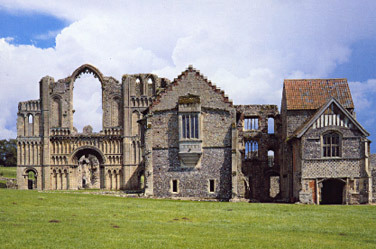 Visit the English Heritage website for opening times and prices. 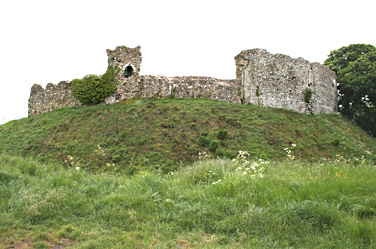 By the early 13th-century Castle Acre castle boasted extensive walls built on raised earthworks in the lower ward below the keep, as well as a west and east gate, protected by an outer defence known as a barbican. 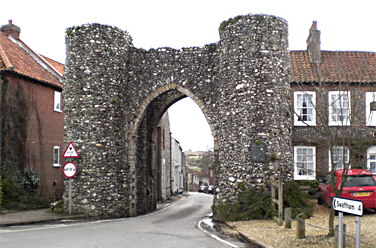 The Bailey Gate still survives, the former north gateway to the 'planned' walled town newly created outside the fortress. Today the main road into the village still runs between its towers. The Apple Café is now open in the gardens, serving breakfasts, light lunches, cakes and cream teas. The Café is open from Easter to the end of September. 9:30am-5pm, 7 Days a week. 1st February to 30th November. 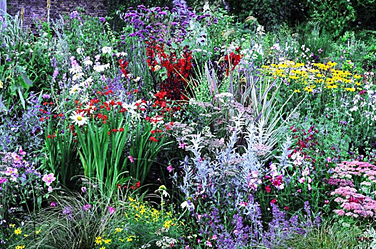 Visit the West Acre Gardens website. 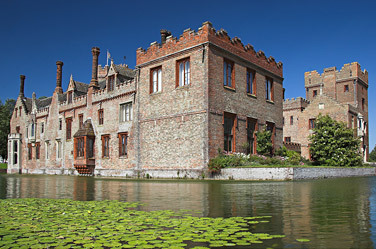 Oxburgh Hall is a 15th-century moated manor. Attractions at Oxburgh include; Secret doors and priest's hole, Mary Queen of Scots embroideries, The Bedingfeld family still in residence after 500yrs, Magnificent Tudor gatehouse, French parterre, Woodland walks and trails. Visit the Oxburgh Hall website. 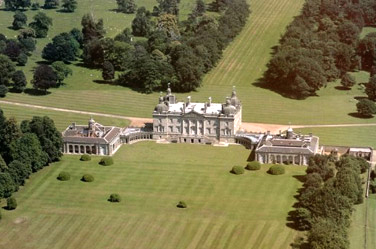 Houghton Hall was built by England's first Prime Minister, Sir Robert Walpole. Attractions at Houghton include; a five-acre walled garden, stables, rare white deer, soldier museum, church, summer concerts & organic farm produce. 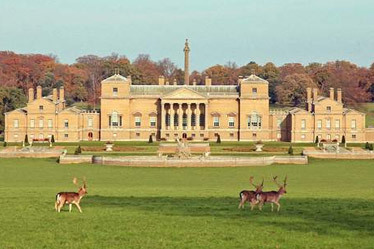 Holkham Hall, home of the Coke family and the Earls of Leicester, was built between 1734 and 1764 by Thomas Coke, the first Earl of Leicester. There is plenty to see and do at Holkham including: the hall, the grounds, café, tearooms, pottery, shops, Bygones museum, history of farming exhibition, lake cruises, summer plays & cricket matches. Sandringham is the much-loved country retreat of HM The Queen, and has been the private home of four generations of British monarchs since 1862. The house, set in 24 hectares of stunning gardens, is perhaps the most famous stately home in Norfolk and is at the heart of the 8,000-hectare Sandringham Estate, 240 hectares of which make up the woodland and heath of the Country Park, open to the public free of charge every day of the year. Visitors come to see the House, Museum and Gardens or just to enjoy the Country Park. 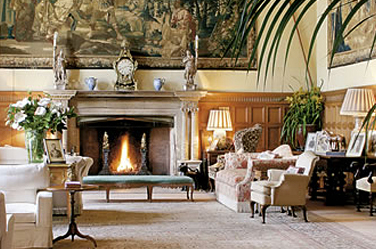 Visit the Sandringham Estate website. A unique attraction for all garden lovers, naturalists, artists and photographers. Six beautiful acres of waterways, ponds and bridges. Plus 8-acre nature trail, kingfisher hide, plant sales and delicious homemade cakes. Dogs allowed. Garden open daily all year 10-5:30 (or dusk). Tearoom open 29 Mar-29 Sept every weekend inc. bank holidays. From 27 May open every day, except Mondays. 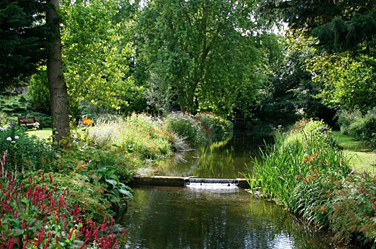 Visit the Gooderstone Water Gardens website. The only windmill in working order in the area open to the public, visitors can climb the five floors up to the fan stage and, when possible, on windy days, visitors can also see the sails and the milling machinery turning. There are many items of interest to see in the tearooms, bakery and grounds. 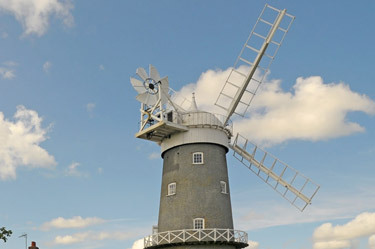 Visit the Bircham Windmill website. 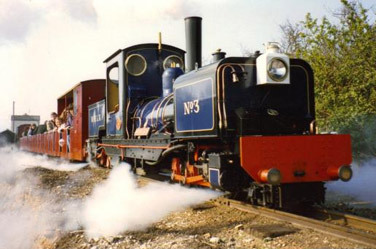 Visit the longest 10¼" narrow gauge steam railway in the world and see the unique Garratt locomotive "Norfolk Hero" which was especially built for this line. Visit the Wells & Walsingham Light Railway website. 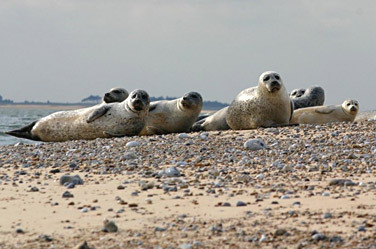 Take a boat trip to see the Seal colony at Blakeney Point, made up of around 500 common and grey seals. A guaranteed experience as the seals are always there. Some trips offer an hour's stop at the nature reserve where you can relax near one of the many secluded sand dunes, see migrant birds, or splash along the shoreline to the the old Lifeboat house, now an information centre owned by the National Trust. Daily 1hr boat trips all year round. The Brecks has one of the most distinctive landscapes in the UK and boasts its best overall climate with low rainfall and hot summers. 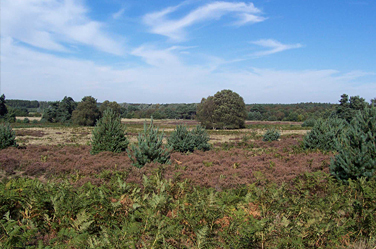 The area comprises vast forests of native coniferous softwood, lines of Scots pines called 'Deal rows' that are sometimes still maintained as true hedges, patches of classic historic heathland that were formed thousands of years ago by the felling and burning of forests for grazing land, and wide arable fields. The slightly sloping, easily draining sandy soil is also perfect for pig-rearing. Thetford Forest, planted just after the First World War by the Forestry Commission, covers 20,000 hectares and, just like the rest of the Brecks, is perfect for cycling, walking, horse riding and orienteering - or a more gentle picnic.